During a late autumn trip through Arkansas’s Ouachita mountains, I stopped at a scenic overlook to enjoy the sunset. As I stepped out of the car, I nearly demolished a plant unlike any I’d ever seen. No more than a few inches tall and without any apparent foliage, its slender stalks bore what I assumed to be seeds. Round and green, they looked like English peas, or thin strings of grapes. Once back in Texas, I began searching for information about my Arkansas oddity. Thanks to Sid Vogelpohl’s article for the Arkansas Native Plant Society, I learned that I’d stumbled across a cutleaf grape fern (Sceptridium dissectum). 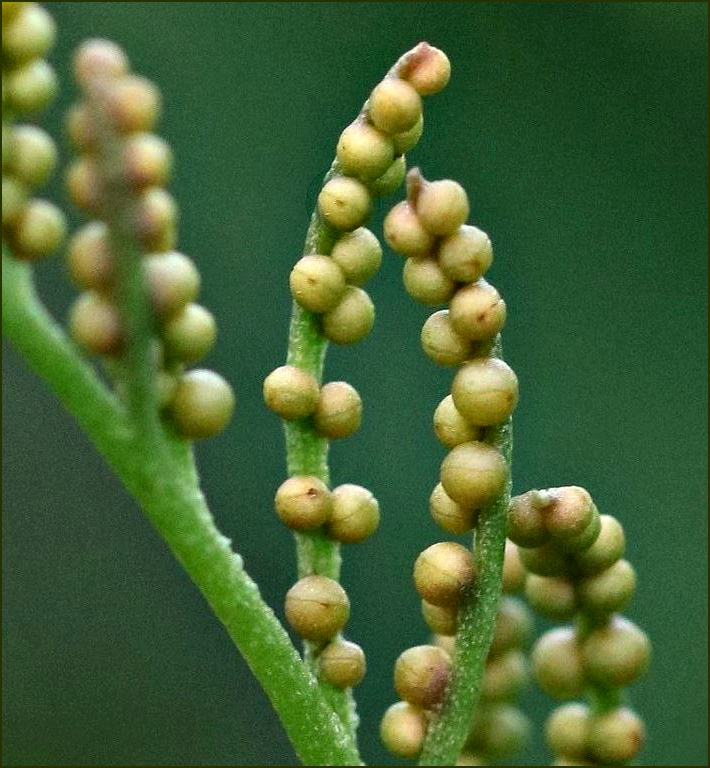 The fern appears in late summer to early fall, produces a solitary frond, and is named for its round, clustered sporangia, which do resemble a bunch of grapes. Intrigued, I posted about the fern on Lagniappe, and continued searching for information. Eventually, I learned that grape ferns also are native to Texas, although they’re confined to the eastern part of the state. Nacogdoches County, one of ten listed as a location by the USDA, was close enough to warrant exploration. 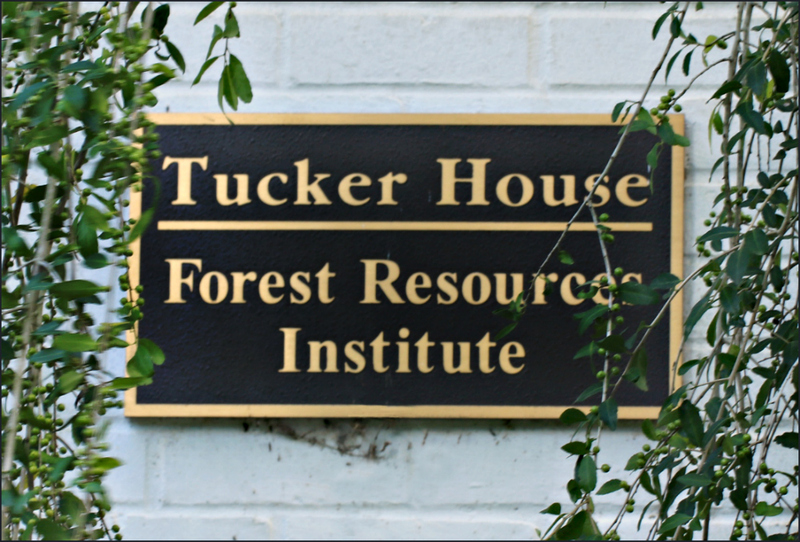 Narrowing my search, I discovered the fern included in a 1999 checklist of vascular plants inventoried at Nacogdoches’ Tucker Estate, now part of the Pineywoods Native Plant Center. Although I’ve evacuated to Nacogdoches during hurricanes and pass through the town occasionally on my way to visit relatives, the existence of the Native Plant Center surprised me, as did the existence of a wildflower demonstration garden there. Promoted by Lady Bird Johnson and named in her honor, the garden grows more than a hundred plant species native to east Texas. As I read about the Plant Center’s history and about the work taking place at Stephen F. Austin University’s Mast Arboretum, I was equally surprised to find that both institutions have been deeply involved with three rare Texas plants: the Neches River rose mallow (Hibiscus dasycalyx), Texas trailing phlox (Phlox nivalis spp. texensis), and a beautiful white flower commonly known as Winkler’s Gaillardia, Texas white firewheel, or Winkler’s blanket flower (Gaillardia aestivalis var. winklerii). 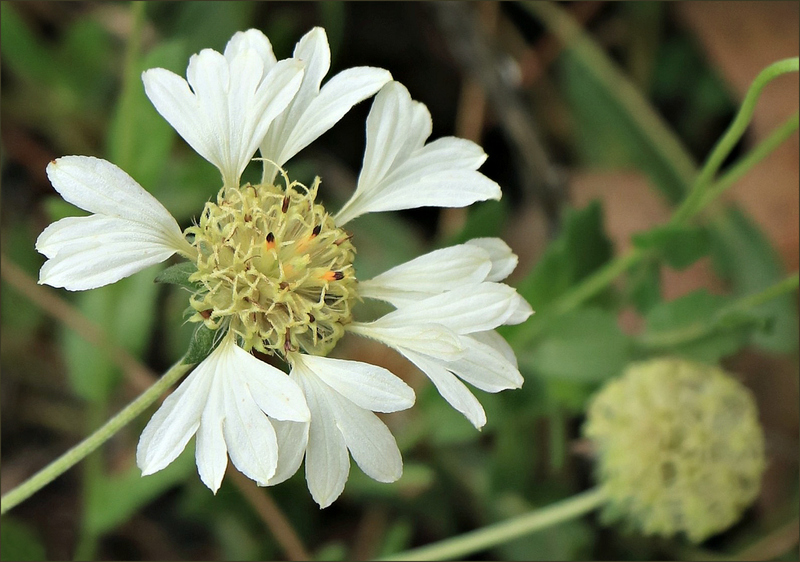 Despite my affection for Gaillardia generally, and my familiarity with the unusual colors it can produce, the thought of a rare white blanket flower astonished me. Clearly, it was time for a trip to Nacogdoches. Arriving at the Native Plant Center, I first asked a pair of young men if they knew where I might find the cutleaf grape fern. They pondered, then pointed to a booted woman pulling a red wagon filled with plants and plastic pots. “You need to talk to Dawn,” one said. Eventually, I learned the woman was Dawn Stover, the person responsible for herbaceous plant collections at both the Mast Arboretum and the Plant Center, as well as for their horticultural greenhouse facilities. When I asked Dawn if she knew where, or even if, the cutleaf grape fern still grew on the grounds, she wasn’t certain. She thought it might be growing somewhere in their forty acres, but she couldn’t take me to a particular site. “Well,” I said, “do you happen to know if there are any of the Winkler’s Gaillardia still blooming?” Her eyes lit up, and she grinned. “I can show you some,” she said. “They’re over here.” In less than a minute, we were standing in front of several beds filled with beautiful flowers. As I began photographing the flowers, Dawn explained the history of the Native Plant Center’s work with them, and her own development of a color form with purple rays and dark centers. A few of the purple flowers still were blooming, but given my love of white flowers, the native seemed far more attractive. Endemic to Texas, Winkler’s Gaillardia grows only in Hardin county, with some occurrences reported in Tyler and Newton counties. Seeing them at the Native Plant center had been delightful, but the experience left me determined to see them in their native habitat: the sandy soils and pine-oak woodlands of East Texas’s Big Thicket. I soon learned that the Roy E. Larsen Sandyland Sanctuary — a 5,654 acre Nature Conservancy site located between Kountze and Silsbee — provides habitat for Winkler’s Gaillardia, as well as for the endangered Texas trailing phlox and a beautiful scarlet catchfly (Silene subciliata). The Sanctuary, a combination of swamp, open-floor forest, and southern pinelands, is rich in plant and animal species, and serves as part of a comprehensive effort to protect and restore the longleaf pine ecosystem on the west Gulf coastal plain. A bit of luck allowed me to make contact with Shawn Benedict, superintendent at the Sanctuary, and he graciously offered to spend some time with me when I arrived. I thought I detected a bit of amusement in his voice when he said he was certain he could help me find some white firewheels. He had reason to be amused; he already knew what I discovered only after I arrived. Scattered throughout the pine and oak woodlands that stretched into the sanctuary, the gaillardia were plentiful and obvious: some still in bud, some in seed, and others in full bloom. After we admired the flowers, Shawn provided a brief tour of other Sanctuary highlights, and then went off to other things. For two more hours I wandered the trails, amazed by the variety of plant life. In that world, so different from the coastal prairies I’m most accustomed to, I wasn’t able to identify many of the plants fading away in the late October sunlight. But finding the Winkler’s Gaillardia had been my goal, and I’d succeeded beyond my wildest imaginings. I especially loved the wildflower table arrangements and little pots of Winkler’s white firewheel. Tomorrow, the men will plant my white firewheel, and I can’t wait to see the beautiful rare blossoms grow in in my very own yard! Thank you so much for your generosity in allowing me to take enough for the ranch, my house in Austin, and the Wildflower Center! 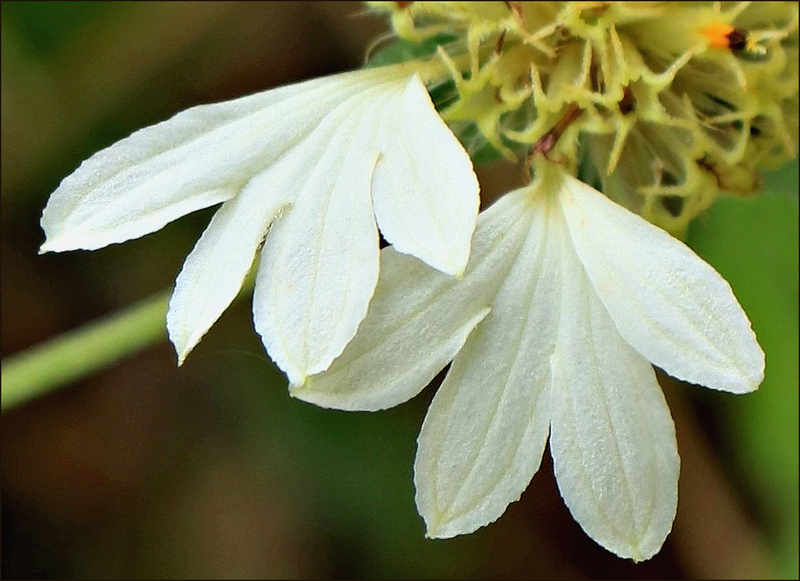 Lady Bird is gone now, of course, but the rare flower she loved continues to bloom in her gardens, at the Pineywoods Native Plant Center, and in the sandy soil of an east Texas preserve. When early summer arrives, I’ll be searching for it again. This time, I know where begin. Comments always are welcome. This piece originally appeared on the Native Plant Society of Texas website, and has been slightly edited. Great account of what was obviously a fine visit to a Texas treasure. It is always great to hear when the staff are friendly and helpful. Lady Bird Johnson’s legacy is substantial indeed and of the very best kind. She would have been pleased to read of your quest to find and enjoy these plants. I’m sure there’s someone less than helpful and friendly among the staff of the parks, refuges, and sactuaries I’ve visited, but I’ve yet to find that person. Even the game wardens are fun to meet, although they might be less easy-going if I weren’t a white-haired woman with a camera. You’re right about Lady Bird’s legacy. Even people who honestly don’t care a whit about flowers during the rest of the year remember her and comment on her work as they’re driving Texas highways in spring. Aren’t they lovely? Apparently there’s been some discussion in the past about whether they were truly a different species, but in fact they are, and I can’t wait to see them again this year. It was the end of the season when I found these. I can see why you like them. The delicate, free-standing petals are exquisite. Those petals are a little unusual, aren’t they? I like the seed balls, too. They remind me of another gaillardia species, sometimes called perfume balls, that lack the distinctive ray flowers of most gaillardia. I’ve been meaning to do a post dedicated to “just gaillardia” — I’ll remember to include them there. I always thought Lady Bird’s fascination with flowers was because Texas was dry, but thanks to you I’ve learned just how full of flowers and beauty it is. Part of what makes Texas so interesting is the variety among its ecoregions. We certainly do have dry, hot and dry, and I think I’m going to die dry, but there’s much more: blackland prairie, piney woods, coastal plains and prairies. When I made my first trip to east Texas, I was astonished. Only three hours from home, there’s a world that’s completely different, and completely delightful. Winkler’s Gaillardia is outstanding! I am only familiar with Indian Blanket flower (Gaillardia pulchella) which is quite common around here. I will have to investigate whether we also have Winkler’s Gaillardia in Oklahoma… even though it is thought to be quite “rare”, I always hold hope that some wayward seed finds its way in the winds and travels on to parts unknown. If you find this flower in Oklahoma, be sure to let everyone know, pronto! I suppose it’s possible that someone might have it in a garden, but I’m as sure as I’m ever sure of anything that you won’t find it in the wild. After all, it’s not shown any tendency to spread even to other Texas counties. That’s part of what makes it so much fun — a true Texas endemic is fun to search for, and great fun to find, at last. This little gem isn’t just “rare,” it’s truly rare, and I was thrilled to be able to track it down. The last two closeups are especially nice. That last photograph is my favorite, although I like them both. I’m looking forward to spending more time with them in their new season. You certainly have given me some places to visit. Are both open to the public? I came across David Creech’s blog awhile ago and have been following him. It is amazing how plants will only grow in a certain area. Are you OK in your area with the chemical release? Yes, they certainly are open to the public. Do you remember my mention of the Ruby Mize azalea gardens? They’re literally in the same neighborhood as the native plant center. They might be only a couple of miles apart, if that. I’d forgotten to link to the Sandyland Sanctuary in the body of the post. The link is there now, with all the infomation you’d need, It’s open sunrise to sunset, I believe, and there’s parking available at the entrance. The winds kept the plume north of us, so we were fine. It stayed far enough above the ground that effects were minimal, although benzene popping up wasn’t good, since it’s heavier and stays nearer the ground. There will be questions about several aspects of this event. Thank you for the reminder about Lady Bird. I have admired her since her highway beatification project. She was ahead of her times in that regard. Love the photo of the Winkler’s gaillardia bud. What a fun outing you had. I was trying to think how long the whole process actually took — a couple of years, at least, since there was quite a gap between finding the fern and getting serious about looking for it in Texas. So much serendipity is involved in so many of these little adventures, and it certainly played a role here. If it hadn’t been for my search for the fern, I might never have learned about the gaillardia. Sometimes people use ‘unique’ when ‘unusual’ would do, but in this case you’re right, Derrick. It is a unique plant, and the loveliness is obvious. It is amazing how a slight tilt or direction of a slope, soil type or ground cover can dramatically alter an environment and well chosen site can account for a wealth of variety. That’s true — and it shows the limitations of that old saw about “bloom where you are planted.”. Plant a Winkler’s gaillardia in Houston’s gumbo soil, and it’s going to pout. Plant a little Japanese honeysuckle in that same soil, and it’s going to take over the neighborhood. We’ve certainly done our part to alter environments in negative ways, but the opposite can be true, too. One of my favorite bits of prairie used to be a rice field. I had no idea there was a white firewheel! so pretty. I love firewheels and the front yard of the studio house next door to our house was filled with them. can’t seem to get them established out here though. I did see that my neighbor has some in his backyard so maybe I’ll get some of his seed heads and try again. I was pretty amazed myself. I’ve seen genetic variations — pink, orange, and yellow ones — but I never had seen a white one. When I found out this is an actual species, and not just one of nature’s little accidents, it was even more wonderful. I wonder why you haven’t been able to get them started. I’ve always assumed they liked drier conditions, but I’ve seen them in ditches and seeps at the refuges, so that can’t be the whole answer. They are such a cheerful flower — I hope you can get some started. Thank you for sharing these Texas treasures with us! I am always drawn to native plants. Years ago I lived near The Big Thicket and remember what an experience it was to visit. Lady Bird’s legacy lives on. Until the past decade or so, I always considered plants to be “just plants.” The distinction between native and non-native never crossed my mind. Now, I understand more about the importance of using native plants, but I’ve come to see them as equals in every way to the cultivars that appear in gardens and grocery stores. It must have been fascinating to explore the Big Thicket. Even my very limited experience of east Texas made clear how different it is from the coastal prairie, and it certainly is different from the coastal bend, Having a different home base from time to time does make exploration a little easier! One of the great changes I’ve seen, even in the few years I’ve been paying attention, is the increasing numbers of ordinary people who are planting butterfly gardens, using more native plants in their landscaping, and so on. Native plants aren’t just pretty; they’re necessary for the health of any number of creatures. The monarchs are the stars of the movement, I suppose, and they’ve attracted the attention of many people who really can’t whomp up much enthusiasm for crane flies or mosquitoes. But everything is connected, so the starting point hardly matters. Very unusual-looking and pretty flower, worth hunting down, and nice to hear about this Sandyland sanctuary with thousands of acres protected. I do love a good mystery, and this little gem certainly qualified. When I think of the number of Nature Conservancy sites I’ve visited — some on multiple occasions — I’m happy as can be for their work. There are a couiple of sites they’re working toward opening for visitors (one in Texas, one in Kansas) that I hope to be able to visit in the future. Do they have any sites in your area? It makes sense to me that they might — especially around the Great Lakes. I’ve been walking all around the city, and when the weather warms up, looking forward to seeing more along the lake shore. I’ll figure out which preserves and parks I can get to by bus, I’m not going to get a car for a while, or when people come to visit and drive here. I recently read about the blue ice that was stacking up along the shores of Lake Michigan. My impression is that it’s all been north of your location, but it’s a nice last hurrah for winter. That being said, here’s to finally getting out of below-freezing temperatures. I suspect you’re more than ready for a little warmth. I enjoyed this post very much. 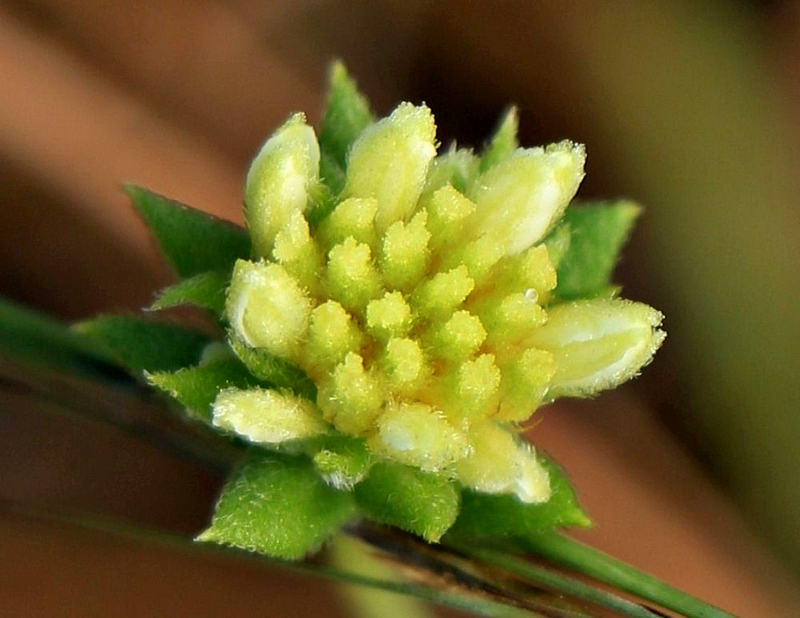 I can imagine how exciting it would be to come upon a species of flower that you have never seen. Thanks for sharing. It certainly helped me to understand birders in a different way. I’ve sometimes laughed at friends who spend hours searching for that ‘one special bird,” but this little saga differed only because I was searching for flora rather than fauna! It didn’t hurt that I got to see three other uncommon/rare plants in the process of finding this one. With luck, I’ll find them later this spring, too, and have some photos to share. That would be super. Thanks, Linda. Thanks for this informative post about your visit. I didn’t know about the Winkler’s gaillardia–so beautiful. Lady Bird truly was ahead of her time. The Winkler’s is beautiful. I think the family resemblance is most obvious when it’s compared with the rayless gaillardia, or “perfume balls.” When I first saw those in the Hill Country, I thought I was looking at drought-stricken flowers that had lost their rays! No — just another of nature’s wonderful varieties. I do think Lady Bird was ahead of her time, but wouldn’t she be pleased to see how many are catching up to her today? Enjoyed this post very much. It pays to be persistent. Thank you, Linda. Over the years I’ve learned that persistence can make up for a lot of gaps, Gerard. Not only that — who doesn’t like a treasure hunt? While the kids are playing their video games, I’m out playing a different sort of game, with real rewards: increased knowledge, the thrill of discovery, and the pleasure of meeting other people who like to play the same games. What could be better? The photos are wonderful and I loved reading about Lady Birds legacy and the reserve in the piney woods. I also, am intrigued with the grape fern. I had never heard of it but is definitely an interesting one. I grew up with just one fern — the standard garden fern that grew along the side of our house. When I moved tio Texas, I learned about maidenhair and resurrection ferns, but I had no idea there are so many unusual ones: not only the grape fern, but mesic ferns that grow in dry areas, and so on. I still think the little round sporangia look like 1950s pop beads. I was happy there still were some of the flowers blooming last fall — I’m glad you enjoyed the photos. I hope I’ll have a chance to get more photos this year, when the buds and flowers are nice and fresh. The Winkler’s Gaillardia is very appealing to my taste in simple white flowers (apart from blue ones which are top of my favourite colour list). Your persistence paid off (and I’m sure you’ll get to see the cutleaf grape ferns in the wild some time in the future). The simplicity of the flower is appealing, isn’t it? Sometimes, I see the ray flowers as little hands — the kind a kid would draw. As excited as I was to find the gaillardia, we’re beginning to see more blue flowers: bluebonnets, blue stars, blue-eyed grass. So many so-called blue flowers have that tinge of lavender or purple, but those three are true-blue; I’ll have some photos for you to see in the nearish future. Very nice detective work! I bet that was fun and interesting! One of the most interesting aspects of the search was how much had to be done in the “real world.”. The internet is a wonderful tool, and it certainly provided a lot of clues. But, in the end, some emails and phone calls and actual visits to the gaillardia’s “home” were necessary — and a good bit of that fun! Thanks, rethy! There are so many little wonders in the world — it’s great fun to find them, and share them! These are beauties, Linda! I’m so glad you dug a little deeper so we can merit the fruits of what you learned. I like white flowers, too, but I find myself zeroing in on that bud. Almost looks encrusted with sugar! I hadn’t seen that until you mentioned it, Debbie, but you’re right. It looks just like one of those French mints that has such a nice sugar shell around a creamy center. It will be interesting this spring to see if that’s the way they all look — there weren’t many buds around last fall. Who knows what else we’ll find in this new season — at least I don’t have to wait for the snow to melt, like you do. It’s even better that it’s a real species, and not some interesting but unpredictable oddity. The chances are pretty good that I’ll find more this spring — another reminder of the reassuring rhythms of the seasons. Bud is lovely. But I am confused over the “adult” flower. It looks like a dandelion puff with part of its “spikes” gone. It the “ball” part were full, it would be gorgeous. Each of the white units looks pretty but they look lonely only part finished. Since I don’t know the names of flower parts, you may not be able to understand my comment. I’m away from home just now, so I don’t have access to my photos. I’ll add a picture or two for you tonight when I get home. But your question is a good one, and perfectly understandable. The short answer is that these flowers are part of the sunflower family, and they’re known as composite flowers. The inner circle (sunflower) or ball (this flower) is made of up”disk flowers.” They’re the ones that become seeds. The outside “petals” are actually ray flowers. They attract insects, and probably have other functions I haven’t learned about yet. The arrangement of the ray flowers on this one is different from most gaillardia, but the disk flowers look more dandelion-like when they’re going to seed. But even in full bloom, the disk flowers don’t look like those on a sunflower. I hope I have a photo. I’ve joined the native plant fan club, Tom. There’s so much variety, and they’re so beautiful. Besides, they’re important for all the critters: for food, shelter, and so on. What’s not to like? The Native Plant Center sounds wonderful. It’s the kind of place that I’d enjoy visiting. I love how a little question what a plant was, led to you discovering this center. It’s like the flower was the key that opened the door to a whole new world. In truth, there probably are keys all around us. We just need to recognize them, and then use them! I’m going to do.a separate post on the Native Plant Center. It’s beautifully done, and it’s also home to some other very interesting plants. I agree that there probably are keys all around us, if we would just time the time to notice and investigate. Some of my best experiences at museums, botanical gardens, etc. have been a bit off the beaten track. I love following your plant detecting stories. And it seems like you had some great clues and helpful informants. Your photos really reveal the elegance of the blooms. Were there seeds for sale at the Wildflower Center? I don’t have a clue whether seeds are available — probably a sign that I’m an appreciator, not a gardener. I doubt that they would have been available at the Pineywoods Center. If anything,they might be available through the seed bank at the Lady Bird Johnson Wildflower Center in Austin. Because the plant is on the endangered list, and so rare, I suspect that any seed collected is being reserved for reestablishment projects in habitat where it could thrive, but I’m not sure. That’s an interesting question, worth exploring. Isn’t it amazing with the abundance and variety of species whether animals or plants that Mother Nature can create in different places. I don’t know much about the nature of Texas, but I have seen it equally abundant in many other places. My comment’s below– I’m using my iPad and got it in the wrong place. Texas is so large, and contains so many different ecoregions, that traveling through the state can be like going from Oslo to the Mediterranean coast of Italy. And every region has its own variety — a lifetime wouldn’t be enough to explore it all. I started a little late, but the exploring certainly is enjoyable. When you finally get here, I know someone who would be more than happy to serve as your guide. It would be great fun to show you around. Thank you. I certainly will keep that in mind. What wonderful photographs of such beautiful flowers! On a few treks that we have done, I have been quite intentional about trying to capture images of wildflowers, finding a kind of deep joy in this. Alas, I have not been quite as disciplined as you in getting more information about them, but perhaps that virtue will arrive in due course. At any rate, I am so glad you were able to get this particular lesson started with a simple glance down at your feet’s near destruction of a dear flower. They are beautiful flowers, and I’m looking forward to seeing them again this spring. I still have many photos of flowers that lack identification, but I often can get to the genus, if not the species. I confess that in a forced choice between going out among the flowers and spending time in identification, I’ll always head outdoors. Thank goodness for rainy days and evenings! One thing certainly does lead to another, if we allow it. One of the great joys of growing older has been a recapturing of my childhood curiosity. I lost it for a while, as so many adults do, but I’m glad it’s back. It’s easy to speed by Nacogdoches, given that nice loop. I confess I was surprised by several things once I got into town, including the size of the Stephen F. Austin campus. There’s so much history there, and wonderful old houses. The azalea gardens weren’t blooming, but they were huge, and would be a real treat for anyone who enjoys that traditional southern plant. The town’s close enough to make for a nice weekend, and there are some great places to hike in the outlying areas! Lots of lovely images, but the closeup of the bud stands out. Nice angle, pretty light. What a beautiful gaillardia species! I suspect I was lucky to find that bud in October; it allowed me to capture the plant’s entire life cycle instead of just bedraggled flowers and seed heads. I was even luckier that the town of Silsbee was so close, and that they had a Walmart. The day I took these photos was the only day in my years of wandering that I left home with no card in my camera. What a surprise that was! SFA used to be the title college in the piney woods that graduated school teachers and forestry majors. I guess the forests are a surprise to those only having seen the parched westerns. It is a bit like an enchanted forest ( just step over the college kids). How nice there’s a wild flower compnent now and that Lady Bird got to see it. The state owes much of its current beauty to her efforts. Great photos! The second one looks like the intricate center is shouting in happiness with those heart petal – what a talented engineer created all these? I still remember the first time I flew into Houston. We came into Intercontinental from the northeast, and I couldn’t process all those pine trees. I didn’t exactly think Texas was desert, but I certainly didn’t expect the variety those trees hinted at. As for Lady Bird, one of these days I’m going to get myself to the Wildflower Center in Austin. There actually are several places I’d like to visit there, and it’s high time I do so. When I used to hang out there, I didn’t give a flip about flowers. I spent my time at places like the Broken Spoke, back in the days before Luckenbach was selling t-shirts and had “No Parking” signs. I found a flower last weekend that looks remarkably like this one, except it has the traditional blanket flower colors. The ray flowers have the same shape, though, so it has to be related. Photos to follow, once I get an ID. We should all be thankful for Lady Bird’s work. She was so dedicated. I can’t help but think of her when I see wildflowers that the State has planted in the median strips and along the sides of Interstate Highways. I get a kick out of your adventures. I like the idea of hunting wildflowers better than hunting animals. Back in the day when Euell Gibbons’s Stalking the Wild Asparagus was popular, I used to think that was the silliest title in the world, and a pretty silly occupation at that. Well, I’m no forager and I’m not about to try living off the land, but now I get the impulse. Wildflower hunting is great fun, although the people who see the flowers only in terms of selfie background are causing some problems here and there: trampling, picking, and otherwise destroying the flowers. I read yesterday about a Washington County property owner who got so miffed at the crowds of people around his amazing bluebonnet field, he plowed the whole thing up to get rid of the people. Lady Bird’s influence never has waned. In fact, it may be increasing, as awareness of the importance of native plants grows. At least the state is figuring out that it’s best now to mow until the seeds have formed. Treasure hunts aren’t just for kids any more — even big people can enjoy them. This was a plant well worth searching for: not only because of the flower itself, but also because I was introduced to so many great people and places along the way. Your comment on my blog reminded me of my intention to read this post. As I have been exploring the not so obvious ecoregions of the Sonoran Desert, you have been exploring ecoregions in Texas and much more delicate flora, the Winkler’s gaillardia. How lovely. And how lovely for you to see this rare flower blooming. The pattern of bloom is fascinating as is the seed head, so obvious and right out there. When do they bloom and for how long–did I miss that in the article? I would love to visit the Native Plant Center. My bucket list continues to grow. But here in the desert I have seen so much beauty. Soon, I will show you a rare cactus, so different from your delicate gaillardia. The Wildflower Center’s site says they bloom in June, July, and August, although these were blooming in October. I suspect they’ll be earlier than June this year. The nice thing about the Nacogdoches area generally is that there’s so much to explore. The Big Thicket would be a natural for you, given the number of places you could set up camp. I still haven’t written about my stay in the woods outside Nacogdoches — I keep going, and looking, and it cuts into my writing time. No matter. Nature posts are time-limited, and I always can go back and catch up on the writing, but there’s no going back to catch up on a bloom. I’m wondering if you saw the “famous” fasciated cactus that appears in so many photos from that area. I found a fasciated Indian paintbrush — yet another post for Lagniappe, once I get the photos processed. I do love the details in your posts. One of these days I’ll go west, and your blog will be part of my guidebook. You might want to tuck the link to this blog into your files. It might come in handy, both for travel planning and for plant identification. What fascinating plants! I like the grape sporangia – I would be tempted to give them a nibble. And who ever heard of a white Gaillardia. Sadly when we were in Austin during the holidays a few years ago the Ladybird Johnson Center was closed. At least a few more people know about the white gaillardia, now. I’ve become intrigued by the number of Texas endemics there are in the plant world. Even those that aren’t listed as rare or endangered can be immensely interesting. Botanical treasure hunting is so fun, isn’t it? That reminds me of the butterfly monitoring group I was a member of. We wanted to see Regal Fritillaries. They are extremely rare here, nearly extinct. But we’d heard they live at Medewin Preserve, so off we went on a field trip, hoping anxiously we’d be able to spot one or two. When we alighted from our vehicle, we had to laugh. They were everywhere! Now a herd of bison runs free there, so people aren’t allowed as much access. Botanical treasure hunting’s fun, but it can be exhausting, too. I pushed myself a little too hard last week, and while I certainly found a lot of treasures, I was glad to go back to work this week so I could rest up. Your regal fritillary is beautiful. I see Gulf fritillaries often, and when I was in Kansas saw the spangled, but those are the only two I’ve encountered. It must have been quite an experience to have so many to enjoy. I thought of you last night. I’d put a photo of a spider up on BugGuide, and received an identification from a couple who are involved in ecological restoration, teaching, and such in the Chicago area. She is a retired pharmacist; I think he taught as a profession. It really is wonderful that people are so willing to share their expertise with people like me who are just learning about so much of the natural world. Yes, it is a wonderful group of people isn’t it? And you are right about plant hunting being exhausting. When I started out I was healthy and easily walked 2-3 miles a day, gleefully jumping into dense brush, dunes, wetlands, whatever. I think I “broke” myself somewhere along the way, possibly contracting Lyme’s Disease, because suddenly one day I couldn’t even walk across a room let alone a prairie. It has been a battle but I’m stronger now and can manage short forays into nature. If you ever get the chance, Illinois Beach State Park is home to 3 species of fritillary as well as 40 other species of butterflies. A hot July day can be dizzying, watching them all zip about. They are in sharp decline, however. I wonder how much longer we will have them. I didn’t realize you’d had struggles like that. I’m glad that you’re doing better. There are so many ways to be injured in nature. Some are dramatic and obvious, like a snake bite. Others are sneaky, like the diseases that come from insects and water. When I was visiting a prairie preserve near Kansas City last year, people kept urging me to watch out for ticks. I’d never given them a thought, because I’ve seen only a half-dozen or so down here. It never had occurred to me that just as we have different species of flowers in different areas of the country, of course there are different threats! Yes, exactly! When my family moved here in the 70’s, there were no deer, and so there were no ticks. Once the deer started spreading back into the area, ticks arrived as well until now if you go off trail you can quickly become covered with them. The scary ones are the young ones because they carry just as much disease, but are so tiny they are hard to see and hard to get off. ugh. It makes me really sad, remembering how once we could just plunge into the wild without much thought, and now, you really can’t here. Our little masasauga rattle snake is practically gone from these parts, but one can still fall. A friend of mine is a field ecologist, and one day he fell down a ravine and broke his leg. Thank goodness he had another biologist with him that day. I’ve fallen a time or two, and now I do carry my phone with me. It doesn’t take a ravine; even a tree root can do us in — or rocks hidden beneath greenery, as I learned in the middle of a Kansas field. Of course, there are equal dangers everywhere. It’s a risky world out there, but who wants to stay at home and sit on the sofa? Right. My dad left me a stout walking staff which I keep telling myself I should start carrying. We don’t need to poke underbrush to ward off snakes, but it is becoming increasingly common to encounter people with dangerous dogs they cannot control. The trouble is I’m afraid I’d be so flustered I wouldn’t be able to use it effectively. I’ve even considered a gun. Why do the least capable people insist on having pit bulls? They call them “pittys” and I want to smack them. That’s quite a story— Texas has such a wealth of wildflowers! I love the clean, cool white and the simplicity of this one. We’re wealthy, indeed. This past week I did a bit of roaming, and found at least three flowers I’ve heard of but never seen, and a couple that I’d never heard of. There’s always something new, or a new way to see something old, and that’s the pleasure of it all. I really enjoyed the mystery and adventure of your story, Linda. I have been in my glory this week and past, for the wildflowers where I live that are showing their beautiful faces, so your post was especially enchanting. I love that you engaged with the professionals, got answers to your questions, and found so many lovely flowers. I have a special place in my heart for Lady Bird Johnson and the beauty she brought to so many people with her wildflower endeavors, so I loved reading her letter of thanks about the white firewheel, and her plantings. Great photos, a post much enjoyed…thank you, Linda. I’ve always admired Lady Bird, and been interested in her life, but until my little adventure with the white gaillardia it never had occurred to me that we might have something in common: love of a particular flower. Now, I wish she were still with us — I’d pen a note to her, and tell her the story, too. I’ve been reading about the California wildflowers: the extravagant bloom, and some of the problems associated with people’s unfortunate behavior. One of our local places, Wildseed Farms, was wise enough to create a “photo field” of bluebonnets, where people can take engagement photos, or photos of their children, and so on. Having a special place to do that helps to preserve the fields of flowers, which otherwise would be flattened by over-enthusiastic Instagrammers. After such a hard winter for so many people, it’s delightful to see color coming back into the world. Enjoy as much of it as you can! Fascinating, Linda. You always find the most fascinating things and know just the questions to ask — and don’t hesitate to ask them, which I really love! As always, your images are beautiful but I love the story, the journey, even more. When I think of how shy I was as a child and young woman, it amazes me that I’m willing now to approach perfect strangers with my questions. But in truth, they’re often pleased to find someone interested in the work that they’re doing, or their own deep commitments. Besides that, I’ve found that plant people, like bird people, almost always are glad to share their knowledge, and enjoy swapping tales. In that regard, they’re not that different from boat people, or bicycle people, or knitters, or…. Let’s face it — we love to share our enthusiasms. “English peas” is exactly what I thought when the image was loading! You are so kind to allow us to accompany you on your outings – your narratives make us feel as if we’re with you! Am in the cloud forest, and the rains have been heavy – so loud on the roof right now it’s hard to think! In random searches for information about the weather here (if it’s flooding elsewhere in the country) I stumbled upon this – who knows how – but I chuckled and thought of you! I’m glad that you enjoy coming along on my wanderings. Not everyone appreciates the excitement of finding a strange or rare plant — or even an especially pretty one, for all that. I enjoyed the article about the frozen fruitcake, especially this line: “The fruitcake’s tin is not as well preserved as the cake itself.” I wonder if you landed on that article because of another article, linked inside the fruitcake story, about the watercolor of a tree creeper bird. That was as interesting to me as the fruitcake, and surely will be of interest to you, if you haven’t already read it. It’s amazing that the painting survived all those years — and equally amazing that it’s going back to Antarctica. I see that the museum in Christchurch has reproduced the painting. Perhaps Gallivanta knows about it; I’ll send her a link. It’s amazing how random subjects align and seem to make sense,, from birds to fruitcakes to Christchurch and our beloved Gallivanta! I did not follow that tree-creeper link because the fruitcake story amused me, and I suspected it would give you the same chuckle. Yes, I laughed about the cake outliving the container – a testimony that makes us question the ingredients of the fruit cake and our aversion – instincts to avoid the fruitcake experience! Still raining like crazy here – so loud on the tin roof of the hostal – but hey, i’m glad to be at roof level – the earth still shakes here quite often. So happy that you were successful in your journeys. That Gaillardia is lovely. How nice that as a lay visitor you were able to spend time with knowledgeable staff. I hope that you are able to find some Texas Cutleaf Grape Ferns. I enjoyed meeting everyone along the way. In fact, Shawn Benedict, who gave me the tour of the Sandylands Sanctuary, mentioned that he’d be willing to give tours or make presentations, so I suggested him as a speaker for our Native Plant Society chapter. Things worked out, and he’ll be coming here for our June meeting: a nice result of a chance meeting. Good for you, and Shawn, on finding a speaker for your chapter’s June meeting. I hope you get to sit up front. I’ll be just as happy to stay in my accustomed place near the back. A low profile suits me just fine.